Lithuanian practice Aketuri Architektai has paired pale grey interiors with dark timber joinery for this family apartment in Vilnius. 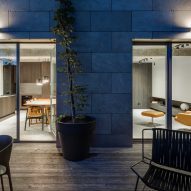 The apartment, which is shared by a couple and their young child, is set within a recently-built residential development. Being frequent travellers, they approached local practice Aketuri Architektai to create a series of contemporary yet comfortable rooms that they can relax in whenever they're in Vilnius. "It had to be a place for recreation, comfort and composure," said the practice in a statement. "Willingness to make interior spaces calm, pure, and free of unnecessary details was one of [the project's] ruling intents." 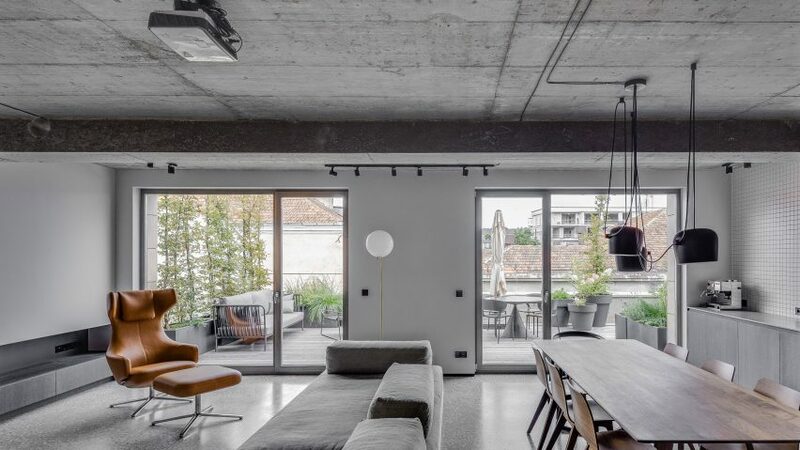 The architects began by knocking through a partition wall to turn the apartment – which had initially been two separate units – into one singular living space. The front of this enlarged apartment is dedicated to an open-plan dining and sitting room, completed in a dark, restrained colour palette intended to "bring balance and refinement to a cosy urban interior". Walls have been painted a shade of pale grey, matched by a rough concrete ceiling and stone-coloured sofa that sits at the room's centre. The floors have then been clad in grey terrazzo, while clean white tiles form a grid-like splashback in the kitchen. Touches of warmth are offered by a tan-leather armchair by Vitra and a timber dining table. 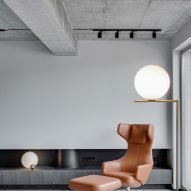 Spherical lamps by Italian lighting brand Flos have also been used to dress the space. The other side of the home plays host to the bedrooms, which have been concealed behind darkwood joinery to provide a sense of privacy. Following the patina of the living area, the bathroom has also been completed in unevenly finished grey tiles.